Pretty little stemmed goblet was a souvenir from 1950. 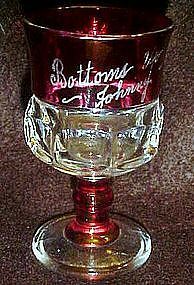 The date "1950" on one side, and on the other side it says "bottoms up Johnny". Kings crown, thumbprint, with ruby red flash on stem and top. Measures 3 5/8" tall and is in perfect condition.